alaTest has collected and analyzed 102 reviews of Garmin Fenix 5. The average rating for this product is 4.6/5, compared to an average rating of 4.2/5 for other products in the same category for all reviews. We analyzed user and expert ratings, product age and more factors. Compared to other products in the same category the Garmin Fenix 5 is awarded an overall alaScore™ of 93/100 = Excellent quality. With more than 20 hours of battery life, the ability to track almost any activity and a durable design, the Garmin fenix 5 is the outdoor GPS watch to get. The Fenix 5 is a natural option for hikers, triatheletes, or just athletes in general. It's indestructible, and bound to last as long as they could possibly demand. A Fenix device that won't weigh you down but has all the features you need. 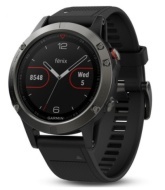 If money's no object, and you have no issue dropping £500+ on a great, modern, connected sports watch, the Fenix 5 will surely leave you satisfied. If money is no object and you have no issue dropping £500 upward on a great, modern, connected sports watch, then the Fenix 5 will surely leave you satisfied. Garmin's Fenix watches are a smart choice for fitness fanatics & adventurers with GPS, sports tracking and waterproofing but they don't come cheap.